One of Riker's former commanding officers, now a Starfleet admiral, takes the Enterprise on a salvage mission that tests Riker's loyalties. I don't mind the "Captain Picard Day" opening--it's kind of fun--but I fail to see how it has anything to do with anything, thematically, narratively, or otherwise. This hook is a little better, since it at least starts with somebody mentioning the Romulans. Don't tell Admiral Pressman what he can't do. The brief mention that Starfleet Intelligence has an operative in the Romulan High Command is brushed aside as a minor plot point, but wait a minute: Starfleet has a spy in the Romulan High Command. Not only is that pretty shady for Roddenberry's Trek (though not necessarily unprecedented), it's also pretty remarkable given what little contact there has been between Starfleet and the Romulans. Perhaps Ambassador Spock has something to do with this. It's always great when Picard talks with the Romulans. When Picard tells Riker that he might have to reconsider the command structure of the ship if Riker lets Pressman put it in danger, he sells it perfectly, but he knows what he's doing. Picard's already made it clear, to Pressman, that he understands Riker and knows that Riker will put the safety of the ship ahead of his own career. Therefore, if push comes to shove, Picard knows that Riker will act appropriately in defense of the Enterprise, even if he has to disobey the admiral's orders. In other words, Picard is hoping that Riker's sense of responsibility to the ship will overcome his loyalty to Pressman such that Riker will tell his captain what is going on, even if doing so puts his career at risk (as it does). 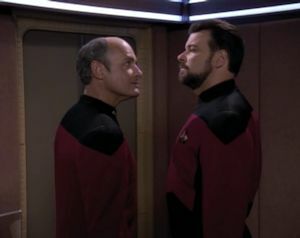 Picard is simply giving him a little nudge to make sure Riker does it. You can draw an interesting parallel between this episode and "The First Duty." Riker is dealing with his culpability in a mistake he made in his youth, just as Wesley deals with the mistake he made in Nova Squadron. It takes Picard to make both men own up to it, to remind them that "a Starfleet officer's first duty is to the truth." When the moment of truth comes and Admiral Pressman orders Picard into the asteroid, to put the ship in danger over the captain's objection, where is Riker? Granted, by not speaking up then, he sets up the climactic argument he has with Pressman aboard the Pegasus, which is worth it, narratively speaking. This is the episode that finally explains one of the lingering questions in Star Trek lore about why Federation ships don't cloak. And now for one of my favorite TNG nitpicks. The Enterprise installs a phasing cloaking device that allows it to pass through solid matter, and with this device engaged, the ship begins to pass through an asteroid. We are even given a cool glimpse of what the internal structure of the asteroid looks like on the viewscreen as the ship moves. However, you wouldn't see it on the viewscreen, for two reasons: (1) there would be no light; and (2) more importantly, the bridge itself--along with every space within the Enterprise--would be full of asteroid. The Romulans, as we know from "The Next Phase," are also working on an interphasic cloak, and here, we see that Federation scientists and engineers have already created a working prototype (though there is no mention of what happens to it by the end of the episode). It's only a matter of time before this genie escapes the bottle, because the march of technology is impossible to stop. This episode is dealing with a pretty straight-forward--but poignant and timeless--theme about why it is wrong to blindly follow orders. The scene where Admiral Pressman and Captain Picard talk about Riker is key, because it shows the two sides of the argument. Picard talks about why he chose Riker, that he wanted a first officer who would risk court martial to do what he thought was right, but Pressman counters that a good officer should have absolute trust in his superiors. Though it is obvious that Riker is dealing with this problem throughout the episode, Picard is also facing the exact same problem. He knows something is wrong, but he is told by his superiors not to worry about it and to do his job without question. Indeed, in the end, both men (along with Worf) disobey Admiral Pressman's orders. The character study here shows that Picard and Riker have something in common, that they both obey the same moral creed where duty is more important than the chain of command. Having said all of that, though, I'm not sure a Starfleet that would have so many people at the top willing to risk war with the Romulans by breaking a treaty so blatantly is what Roddenberry envisioned. But hey, I'm a fan of moral ambiguity and a believer that corruption knows no rank, so I'm cool with injecting this kind of cynical realism into Star Trek. One of the reasons "I'm cool with injecting this kind of cynical realism into Star Trek" is because I know how much good it does for DS9 in the future, especially during the Dominion War and in one of my absolute favorite--and one of the darkest--episodes in all of Trek, "In the Pale Moonlight." ENT's final episode, "These Are the Voyages...," takes place in the middle of this episode.